BBC Weather said it will remain dry at the start of the week before a weather system engulfs the country and triggers heavy rainfall amid rising November temperatures. 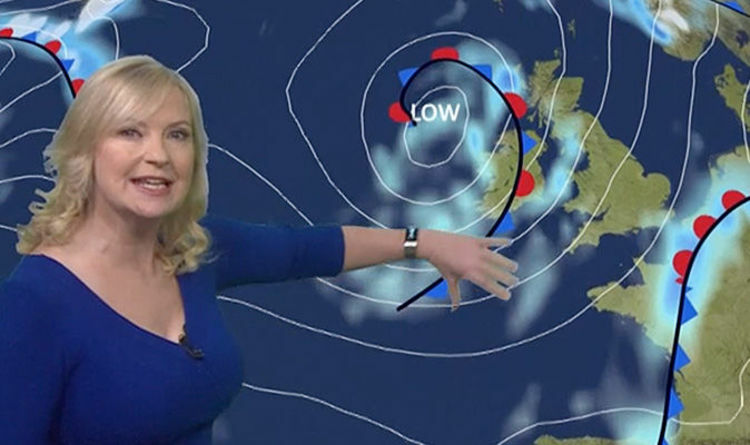 BBC Weather forecaster Carol Kirkwood said: “For many today it will remain dry and we will see quite a bit of sunshine. For those showers in the west travelling a little bit further east through the day so you may well catch one, for example, in the Midlands. Noticeable breeze and temperatures roughly between about 10 and 14C. Through this evening and overnight we hang onto the showers in the first half of the night and then a ridge of high pressure starts to build in from the west so many but not all of those showers will tend to ease.” The BBC host then warned that Tuesday will start with showers across parts of the country which could continue into the afternoon for western parts of the country. The Environment Agency has issued seven flood alerts for the UK, warning that Britons must be prepared as flooding is possible. Ms Kirkwood added: “There could still be one or two left through the afternoon in the west. Most of them will fade and then we are looking at a relatively dry day – quite a bit of sunshine around a noticeable breeze. The BBC Weather presenter said the driest parts of the country will be in London and central, eastern and southern parts of England. She added: “It’s going to be breezy but I’m showing you this chart because it is our temperature chart – we have got ambers back on it so the temperature is rising. “By the time we get to Wednesday the range will be about 12 to 15, locally we could even see 16. He added: “As we go through the day we have some pretty brisk south westerly winds, and those will help to drive those showers further eastwards, particularly as we head through the afternoon. “Those showers will be particularly blustery at times as well, and in there we could also see a little bit of hail or even thunder at times. The Met Office forecaster also said it will feel a “touch warmer” as the week progresses.